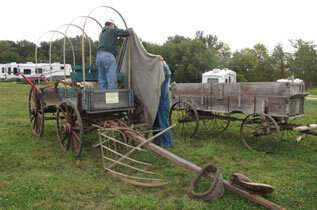 CAPTION: Todd Williams (LEFT) and Mike Williams (RIGHT) were covering a wagon owned and restored by Mike Williams for the Farm Wagon Contest, a new event this year at the Steam and Gas Association Old Time Harvest Days. Also assisting in covering the farm wagon was Marvin Hinnen. The 23rd Annual Old-Time Harvest Days, hosted by the Livingston County Steam and Gas Association, will be this weekend at the Livingston County Fairgrounds, on Missouri Route 190. 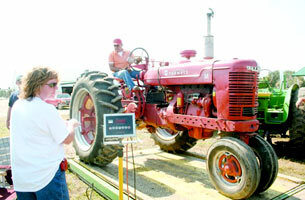 The three-day event will include a large garden tractor display featuring Wheel Horse. The featured tractor will be Massey-Harris/Massey-Ferguson. New this year will be a Farm Wagon Contest with cash prizes of $30 for first and $15 for second awarded for the most original, most unusual and most unique farm wagons. John Meneely, president of the Steam and Gas Association, hopes to have a good turnout for the event. “Each year we try and do something different,” Meneely stated. Laura Ingalls Wilder stories, presented by Debbie Peel, will take place on Friday and Saturday with story times at 10 a.m., 11 a.m., 1 p.m. and 2 p.m. Rusty Stings Band will be the entertainment for Friday night starting at 7 p.m. The Old Town Jamboree Show will be held Saturday at 7 p.m. Kids Day is all day Friday, Sept. 25, and begins when the first bus load gets there. 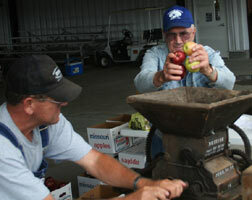 Area schools have been invited to attend the Old Time Harvest Days including 350-400 students. Activities for the kids include stories by Laura Ingalls Wilder, demonstrations and games. 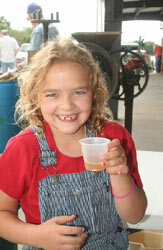 CAPTION: Josie Reeter, 7, daughter of Jamie and Julia Reeter, tasting apple cider. The smooth taste of apple cider, the smell of fresh-cut lumber, the putt-putt-puttering of old tractors, and the conversation among lifelong farmers all tugged for attention at the 23rd annual Old-Time Harvest Days held over the weekend at the Livingston County 4-H and FFA Fairgrounds. With the goal of preserving the past for future generations, the Livingston County Steam and Gas Association hosted its annual event which featured many of the things a person would have seen in rural Missouri many years ago. 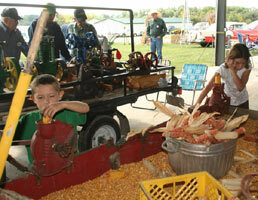 Harvest Days began Friday with Kids Day when an estimated 300 students from local and area schools attended. Then, on Saturday, everything was in full swing with demonstrations taking place throughout the grounds. “Saturday was a tremendous day,” said association president John Meneely. 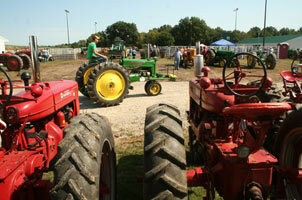 Visitors could participate in a pedal pull, free pony rides, a tractor rodeo and wagon rides. They could watch apple butter, apple cider and butter being made and sample each when the process was finished. They could try their hand at shelling corn and grinding corn and making rope. 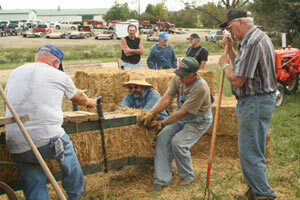 Visitors could also witness threshing, baling, and a blacksmith at work. On Sunday, the day began with a church service, followed by the day’s main attraction which was the tractor pull. Although Friday’s rains had created muddy conditions and threatened the tractor pull in the arena, crews were able to bring in a road grader and scrape off the layer of mud. The number of entries in Sunday’s tractor pull was up from previous years with a lot of new participants. Gate attendance for the three-day event was up by about 20 percent over last year, Meneely said. The association president applauded the work of the association members and others who helped organize the show. The sights and sounds of a by-gone era came to life over the weekend as the Livingston County Steam and Gas Association hosted its 23rd annual Old-Time Harvest Days at the county fairgrounds. Here, volunteer workers demonstrate how hay bales used to be made with a stationary baler and using residue straw from a threshing machine.